As we all know, Fantastic Fest is well underway down in Austin, TX. One of the highlight events is a special screening of An American Werewolf in London, with special effects icon Rick Baker, who is also receiving a Lifetime Achievement Award, there for a Q&A (watch it here). 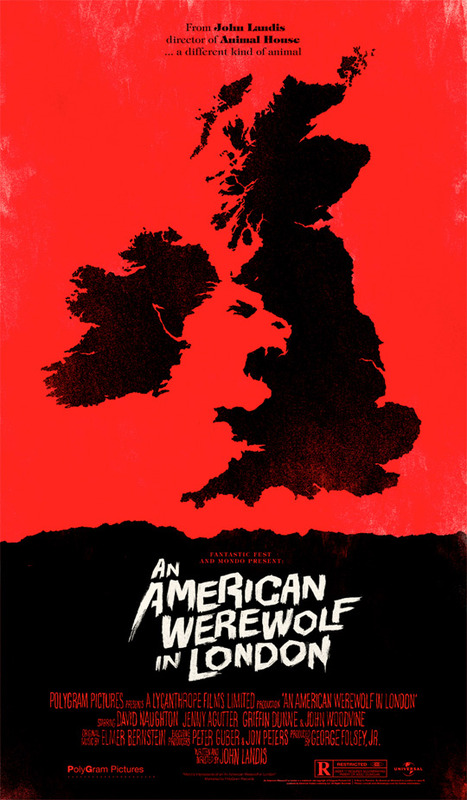 Along with the screening, they're selling an exclusive Olly Moss designed American Werewolf in London poster, which we haven't seen until now. Movies.com got the debut on the poster, which comes with a variant as well, likely a different color but we haven't seen it. It's pretty awesome, especially if you're a fan of Olly Moss or these stylish Mondo posters. I love American Werewolf in London, and this is just a sleek, simplistic design that works well, I really dig it. There's only a few ways to get one - they're having an "@ollymoss in-store signing tomorrow [Sunday] at 1pm where we'll sell the AMERICAN WEREWOLF IN LONDON variant poster." They also already gave out a poster to everyone in attendance at the screening event in Austin tonight. If you're waiting for online, you should check @MondoNews as they always have info on what they're going to sell online and when. Movies.com says that they printed 380 in a size of 15"x24", so there may be extras, otherwise check eBay. Just another awesome Mondo poster worth mentioning. Follow our own Fantastic Fest 2011 coverage here. Took me a second to work that one out. Oh my god! Wales is full of them. Oh. Now I see it. I was like wtf? The British Isles look kinda weird. I like me that type!